FILE - A Syrian Defense Force fighter keeps watch from a rooftop on the outskirts of Baghouz on Feb. 17, 2019, in Baghouz, Syria. U.S.-backed Syrian forces on Tuesday seized control of an encampment held by ISIS in eastern Syria, after hundreds of militants surrendered overnight, a spokesman said, signaling the group's collapse after months of stiff resistance. A group of suspects involved in a January bombing that killed four Americans in northern Syria were among militants captured by the Kurdish-led forces. The taking of the ISIS camp was a major advance but not the final defeat of the group in Baghouz, the last village held by the extremists where they have been holding out for weeks under siege, according to Mustafa Bali, the spokesman for the Kurdish-led force known as the Syrian Democratic Forces. Still, fighters from the force were starting to celebrate anyway. "I'm happy it's over. Now I know my people are safe," said a fighter who identified himself as Walid Raqqawi who fought in the camp Monday night. He said he is returning to his hometown of Raqqa to rest. Comrades from his unit sang and danced in celebration at an outpost in Baghouz, all saying they were looking forward to going home. An unknown number of ISIS militants still clung to a tiny sliver of land trapped between the Euphrates River and the encampment now held by the SDF, officials in the force said. The militants have been putting up a desperate fight, their notorious propaganda machine working even on the brink of collapse. On Monday, ISIS issued a video showing its militants furiously defending the encampment, a junkyard of wrecked cards, motorcycles and tents. In the footage, they shoot nonstop with AK-47s and M-16s from behind trucks, vehicles and sand berms. A group of children could be seen at one point amid the fighting. "My Muslim brothers everywhere, we did our best, the rest is up to God," a fighter says as black smoke rises from behind him. The complete fall of Baghouz would mark the end of ISIS' self-declared territorial "caliphate," which at its height stretched across much of Syria and Iraq. For the past four years, U.S.-led forces have waged a destructive campaign to tear down the "caliphate." But even after Baghouz's fall, ISIS maintains a scattered presence and sleeper cells that threaten a continuing insurgency. The battle for Baghouz has dragged on for weeks — and the encampment has proven a major battleground, with tents covering foxholes and underground tunnels. The siege has also been slowed by the unexpectedly large number of civilians in Baghouz, most of them families of ISIS members. Over past weeks they have been flowing out, exhausted, hungry and often wounded. 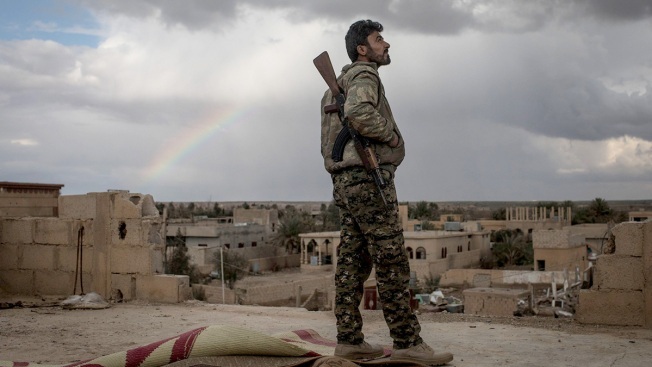 The sheer number who emerged — nearly 30,000 since early January according to Kurdish officials — took the Kurdish-led SDF by surprise. 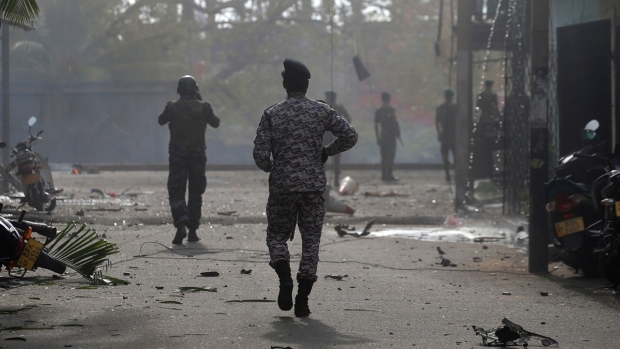 In the last two weeks, many ISIS militants appeared to be among those evacuating. But SDF commanders have stopped speculating when the battle may finally be over. Commanders say they don't know how many more may still be left, hiding in tunnels beneath the war-scarred village. In the seizure Tuesday of the encampment, hundreds of wounded and sick militants were captured and have been evacuated to nearby military hospitals for treatment, Bali, the SDF spokesman, said in a Twitter post. Still, he cautioned, "this is not a victory announcement, but a significant progress in the fight." There were conflicting reports from SDF commanders on the ground about the extent of the ISIS surrender. Commander Rustam Hasake told The Associated Press that SDF forces advanced on four fronts Monday night and were inside the camp when the last ISIS fighters surrendered at dawn. He said the last fighters were pushed out of the camp and were now in an open patch of land by the Euphrates River and were being processed and detained. Another commander, however, said some ISIS militants continue to hold a tiny area in an open patch of land in the village, outside the encampment. AP journalists in Baghouz reported sporadic gunfire echoing in Baghouz and jets circling overhead. At a command post in Baghouz, a Humvee pulled up and unloaded weapons captured from ISIS on Tuesday, including sniper and hunting rifles, pump action shot guns and grenades and ammunition. Five trucks hauling 10 trailers full of people were seen coming out of Baghouz. A child could be heard wailing from inside one of them. At least 100 people, nearly all of them children, have died in the truck trips from Baghouz on the way to a camp in northern Syria, or soon after reaching it, according to the International Rescue Committee — a sign of how miserable conditions were inside Baghouz during the siege as supplies ran out. Bali, in a separate Twitter post Tuesday, said the SDF captured a group of suspects involved in a January suicide bombing that killed four Americans in the northern town of Manbij. He did not elaborate on the number of suspects or whether they were among the most recent militants to surrender. 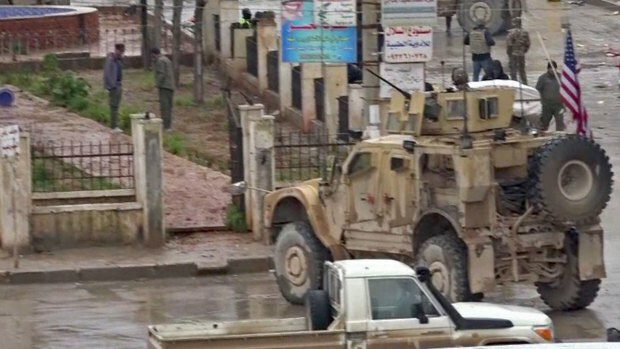 ISIS claimed responsibility for the blast outside a popular restaurant in Manbij, which killed at least 16 people, including two U.S. service members and two American civilians. It was the deadliest assault on U.S. troops in Syria since American forces went into the country in 2015. As they make their final stand, the ISIS militants have issued a string of statements this month claiming to have inflicted heavy losses on the SDF. In an audio posted online Monday, the ISIS spokesman, Abu Hassan al-Muhajer, issued his first message in six months, calling for revenge attacks by Muslims in Western countries in retaliation for the shooting attack on two New Zealand mosques that killed 50 people. He also ridiculed U.S. declarations of the defeat of ISIS, calling the claim of victory a "hallucination." But SDF fighters celebrated as if the final collapse were imminent. At the SDF outpost in Baghouz, a commander danced with his soldiers. Fighters said remaining ISIS militants didn't put up much resistance. "We fired on them with our rifles and heavy weapons and they didn't shoot back. So we walked into the camp and they didn't shoot at us," said Orhan Hamad, from the northern province of Hassakeh. "I tell the martyrs, it wasn't for nothing. With God's permission, we've finished Daesh." Associated Press writer Maamoun Youssef in Cairo and Zeina Karam in Beirut contributed reporting.